At the Wedding Room all our brides and grooms to be, receive our undivided attention in a relaxed and friendly environment. We encourage individual thoughts and ideas and help guide you to your dream dress, flowers, chair covers and much more! You’re not just a customer to us, we believe all our couples become a part of our extended family even after your amazing journey with us is over! Mary is the proprietor of The Wedding Room. With a background in textile design and 10 years experience in the wedding industry you can be assured of expert advice and guidance when it comes to choosing your perfect dress. Following on from a commercial design background, Mary's understanding of colour and composition is evident when inspiring you with your wedding flowers too. After choosing your dress with us we can suggest the flowers to compliment your dress and the capture the style you have visualised. Of course we can still offer a flower service even if you choose your dress elsewhere. Favourite dress at The Wedding Room: Elsa by Eliza Jane Howell. Our admin queen is Lynn. She is responsible for ensuring that from the moment you've chosen your dream dress to the day you wear it, your experience with The Wedding Room runs smoothly. Your dress order is tracked on a weekly basis and Lynn helps us to keep things bang up to date so we constantly know where everything is. When it comes to our chair cover and flower orders Lynn will constantly check those final quantities and details so everything is as you requested. All done with the help of hundreds of spread sheets!!! Lynn's new found love for technology enables her to help with our social media and maintaining our new website. Katharine is our recommended seamstress. With over 35 years of experience Katharine is an expert in her area. Her knowledge of garment construction and fabric is second to none. 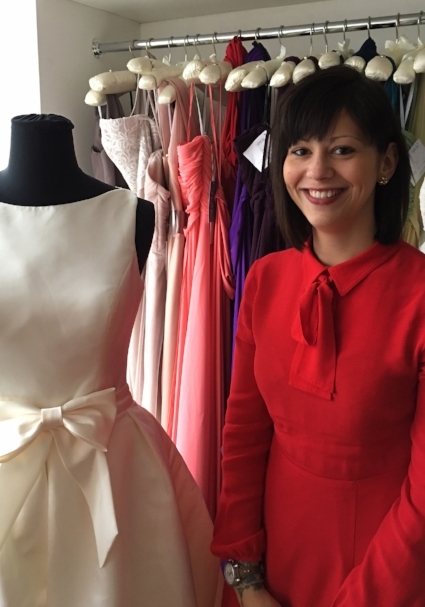 With a quick and sharp eye, Katharine is capable of quickly assessing what needs to be changed and tweaked in a dress to make sure you look your best on the day with everything fitting like a glove. With a willing attitude to personalise a dress to your specification she has been known to apply hundreds of beads to a lace dress before. You are in safe hands when it comes to making your dress fit perfectly. Our newest member of the team, Ashleigh has 5 year's experience in the wedding industry having previously worked at a large boutique in Brimingham.